Our regional center is Galesburg, IL, a city of 34,000. It is the county seat of Knox County and a region of some historical significance. Galesburg was founded in 1837 by a group of Presbyterians from upstate New York. They also founded a manual labor college that became Knox College. Knox is one of the the top 11 colleges in all of Illinois according to Princeton Review's list of best 379 colleges in the United States. Knox is the site of the 5th Lincoln-Douglas Debate as well the birthplace of Lincoln Biographer and poet Carl Sandburg. Lincoln framed his debate for emancipation at the Galesburg debate. Galesburg and Knox College also played a significant role as a safe harbor for escaped slaves on the Underground Railroad. Knox College welcomed black students to study for degree. United States Senator Hiram Rhodes Revels, of African American descent, studied at Knox in 1856 and 57. Galesburg is a major railroad hub for Burlington Northern Sante Fe Railroad seeing over 150 freight trains a day. It is also a quiet-zone city with fewer and fewer train whistles being blown each day. Healthcare in our region is second to none. Galesburg has two major hospitals as well a VA clinic and two cancer care centers. There are several world class medical facilities within a 200 mile radius as well. Our community is 45 miles from the Peoria Metropolitan area and 45 miles the Quad City Metropolitan Area. We are less than 3 ours from Chicago and about 4.5 hours from St. Louis. Includes Cities/Towns: Abingdon, East Galesburg, Galesburg, Knoxville, Monmouth. Our community is host to several events throughout the year including Railroad Days, the National Stearman Fly In, The Rootabaga Jazz Festival, and the Carl Sandburg Days Festival. We are rich in the arts with a thriving community art center, a nationally recognized symphony orchestra and a nationally recognized professional choral group and the oldest active theatre group in Illinois. 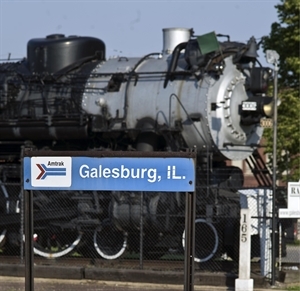 Galesburg was designated by Congress as the site of the National Railroad Hall of Fame due to open before 2020. There are several outdoor festivals including Taste of Galesburg, Cafe in the Park, Concert on the Lawn, the Galesburg Balloon Festival, Knox County Scenic Dr. and Christmas at Walnut Grove Farm. Galesburg has several wonderful dining options from homestyle to gourmet as well as chain restaurants. In 2013, "The Daily Meal" named Galesburg as one of the top 11 small towns in America for dining. Knox-Galesburg Symphony has 6 concerts a year, Prairie Players Civic Theatre has 3-4 performances each year, Galesburg Community Chorus has 2-3 performances per year. Knox College, Carl Sandburg College have several musical and cultural events each year. Galesburg Civic Art Center has Art Shows and openings all year long. Galesburg Railroad Museum, Discovery Depot Children's Museum, Carl Sandburg Birthplace State Historic Site has the Song Bag Concert Series, Bishop Hill State Historic Site has numerous musical and cultural events each year. Fat Fish Pub has 10 or more world renowned award winning blues acts each year. They are also home to the Knox Jazz Combo every Thursday night throughout the year and the Rootabaga Jazz Festival held each year in April. We are an Amtrak community and the gateway west for rail passengers with service all the way to California. Over 100,000 passengers a year board in Galesburg with 4 trains a day to and from Chicago. Our Amtrak station also serves as a Trailways Bus Station. The Galesburg Municipal Airport has Jet-Air, Charter Jet Service and accommodations for individual aircraft. The Quad City International Airport is 45 minutes away. The Peoria International Airport is also only 45 minutes away. Galesburg Cottage Hospital, St. Mary Medical Center, Cancer Treatment Center of Western Illinois, Illinois Cancer Center, Galesburg VA Clinic, Galesburg Wellness Center, over 80 doctors offices. Jan 13.6 F° 22.1 F° 30.6 F° 1.5 "
Feb 17.6 F° 26.6 F° 35.6 F° 1.8 "
Mar 28.4 F° 38.5 F° 48.6 F° 2.8 "
Apr 40.2 F° 51.4 F° 62.6 F° 3.8 "
May 51.0 F° 61.7 F° 72.4 F° 4.5 "
Jun 60.8 F° 71.1 F° 81.4 F° 4.3 "
Jul 64.8 F° 74.6 F° 84.4 F° 4.3 "
Aug 62.8 F° 72.6 F° 82.4 F° 4.0 "
Sep 54.0 F° 64.8 F° 75.6 F° 3.5 "
Oct 42.2 F° 52.9 F° 63.6 F° 2.8 "
Nov 30.4 F° 39.5 F° 48.6 F° 2.9 "
Dec 18.4 F° 26.4 F° 34.4 F° 2.3 "
We are prone to violent thunderstorms. Due to our location in a valley, Galesburg has not had a tornado in several decades. Condos Over 50 Communities Galesburg Towers, Whiting Hall Assisted Living, Moon Towers, Seminary Village & Estates, Kensington Assisted Living, etc. Galesburg Area Convention & Visitors Bureau, Orpheum Theatre, Wal-Mart, Hy Vee Grocery, Knox Community Prairie Kitchen, etc.